An athlete from Leicestershire has claimed a new world record as the fastest person to complete an Ironman competition blindfolded. 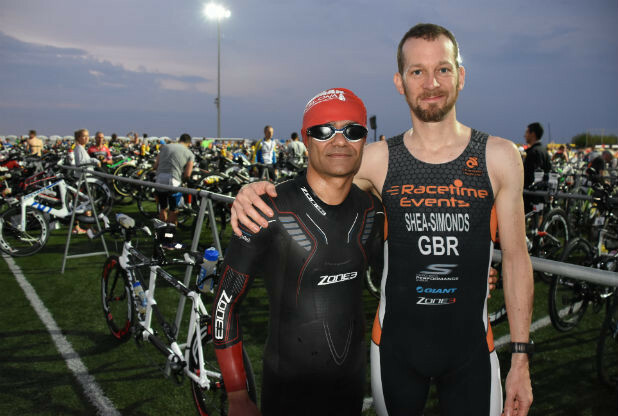 Fully blind Haseeb Ahmad, from Oadby, smashed the previous record for the challenging course – a 2.2-mile swim, a 112-mile bike ride and a 26-mile run – by almost seven minutes. Haseeb, 46, and his guide Duncan Shea-Simonds, claimed the record in the event in Barcelona on October 2. He got confirmation last week (10th) that he is now the official record-holder. They finished the course in 11 hours, three minutes and 31 seconds. The father-of-one said he was inspired by the fact that the race was on the 20th birthday of his daughter Ayeisha, who was there to cheer him on. Haseeb was registered blind at 17 due to retinitis pigmantosa, an incurable condition in which the cells of the retina degenerate.